Pretty healthy too – especially if you use wholewheat noodles. I always have “imitation crab” (surimi) in the freezer. It´s good in sushi of course, but it also works well in crab salad – even though I might have to call it “imitation crab salad”. Whatever – it works! I slice the onions thinly and fry them until crispy in a little bit of sesame oil. The noodles I boil of course. Throw all the sauce ingredients in a pot and let it boil until it thickens a bit. I use about 2/3 of Tamari and 1/3 of miring and rice vinegar. Put the noodles in the sauce and add sesame seeds. 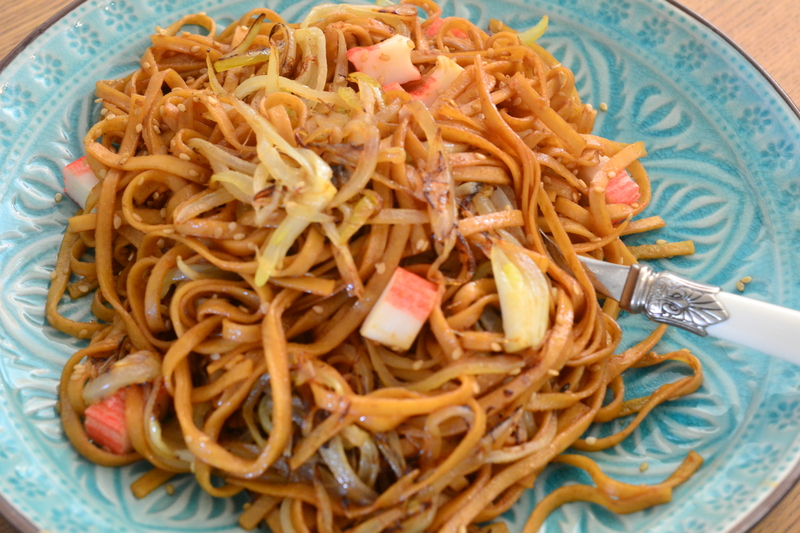 Mix in the crispy onions and a few sticks of “imitation crab” ( surimi ) and lunch is ready.